We're lucky in the US that we don't need to worry much about our water supply. Or at least we don't need to worry about not having drinkable water. Whether it tastes good is a whole other story. And of course, there some of us who live in areas where water shortages sometimes exist. It happens here. But mostly that means that people have brown lawns and are asked not to wash their cars. It hasn't gotten to the point where un-bathed people are lining up for a ration of drinking water. So, with some exceptions, it's mostly about taste. I grew up in Chicago where the water was quite good. Then I moved to a suburb where the water was ... ugh. Not good. I could deal with it for cooking, and tolerated it in coffee. But drinking a glass of it was unpleasant. And it wasn't one of those things you got used to. I moved a few more times since then, and now I'm living in a lovely town in Colorado where the water comes from mountain runoff. It's pretty darned good. But still ... could it be better? 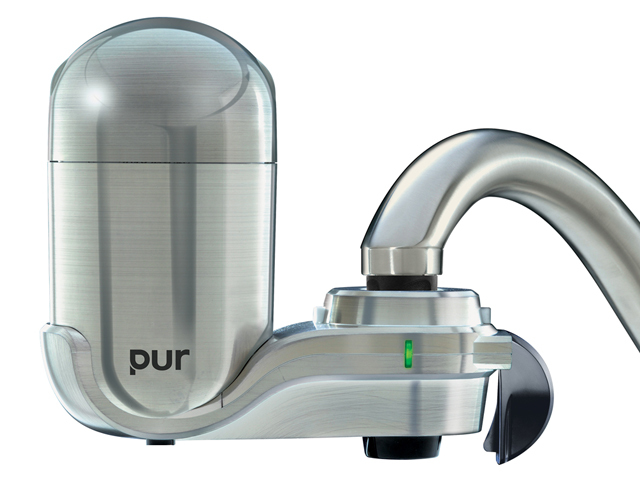 When the folks at PUR offered me an on-sink filter, I figured it was worth a try. Because no matter how filtered the water is before it gets into the system, it could be picking up things in pipes along the way. Heck, I remember one time when my mom got a glass of water from the tap, and there was some kind of ... creature ... swimming in it. As a kid, I thought it was sort of cool. Now, not so much. If you check the screen filter on your water faucet, I'll bet you'll find some grit and debris in there. So you know there's smaller stuff getting through. 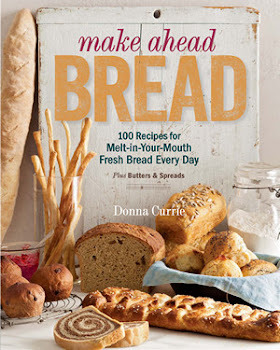 I'm not terribly squeamish about my tap water, but I like the idea of filtered water for my coffee (fewer mineral deposits means that I won't need to clean it as often) and I like the idea of better-filtered water for my sourdough cultures. I mean, my sourdoughs are pretty robust, but I'd prefer to not stress them too much. And regular bread, too. And drinking water. And ... and ... tea! For a while, I had a water pitcher that I kept in the refrigerator, but space in there is at a premium, and keeping water chilled wasn't really a priority. 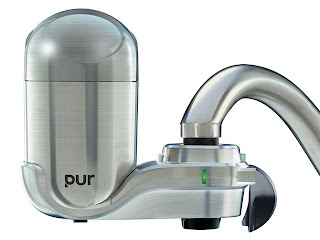 So a faucet-mounted device makes a heck of a lot more sense. There are a lot of different models with different level of filtering, and they mount horizontally or vertically, depending on the particular model. And there are color choices to match your decor. I received a stainless steel model with the MineralClear feature. Installation was ridiculously easy. I took off the end of the faucet (and there was a bit of crud stuck in the screen filter. Ick.) And then I put on the adapter thing that came with the water filter. There were four to choose from, for different types of faucets, and I miraculously chose the correct one right off the bat. Then, the filter just snaps on. Easy peasy. It's kind of ingenious. I mean, I don't need filtered water for washing dishes. That would be a total waste. So you turn it on and off as needed. Filtered water for drinks, unfiltered for washing my hands or doing dishes. A little light blinks to show the status of the internal filter, so you can tell when it's time for a change. And that's that. It's there on demand, any time, so I don't need to have a pitcher in the refrigerator. Love that! I did a taste test of filtered and unfiltered water, and I did notice a difference. So something's going on there. I won't say that the filtered water was astonishingly better, because the water here has never tasted bad to me. 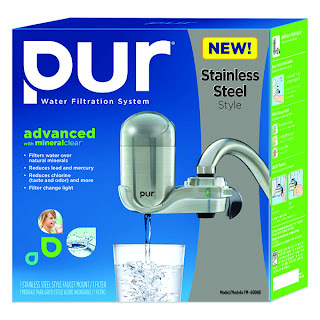 But given that I could taste a difference with this good water, I can only imagine the difference it would have made if I had one of these way back when I lived in that suburb with the terrible water. Disclaimer: I received this product at no cost to me.